Learn how to design and make a combat knife from two who have been there/done that—Curtis Iovito of Spartan Blades and award-winning custom knifemaker William W. “Bill” Harsey—at the 2nd Annual BLADE University. Held the day before (June 4) through show Saturday (June 6) of the 2015 BLADE Show June 5-7 at the Cobb Galleria Centre in Atlanta, BLADE University assembles the world’s leading knife professionals to instruct you on most anything that has to do with the subject of cut. Along with Mark Carey co-owner and co-founder of Spartan Blades, Iovito is a retired U.S. Army Ranger who saw action during Operation Just Cause in Panama and numerous sensitive deployments and missions throughout Asia and the Middle East. It was while in 1st Special Forces Group (Airborne) that Curtis got into making custom knives for his teammates. After finishing up his 20-year career he hooked up with Carey—himself a 21-year man with U.S. Army Special Forces with many deployments in Asia—to start Spartan Blades. A number of Harsey’s designs, including the Green Beret Knife, have won BLADE Magazine Knife-Of-The-Year® awards. Spartan Blades also has won BLADE Magazine Knife-Of-The-Year® Awards with its knives. Today Harsey is one of several custom makers who design knives for Spartan Blades, a list that includes BLADE® Magazine field editor and retired 5th Special Forces Master Sergeant Kim Breed and also ABS master smith John Horrigan. 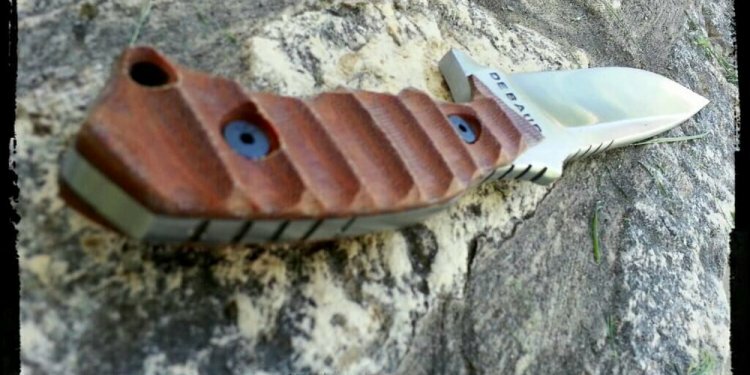 Among Harsey’s design efforts for Spartan is the Difensa combat fixed blade. •Materials that lend themselves to improving a combat knife.